The ‘Arunachal Charity Home’, a Pasighat-based NGO dedicated to development of community health and environment, is gearing up for a ‘green revolution’ through plantation of selected evergreen species, which was launched at Raneghat near historical Pasighat town on the right bank of river Siang on Friday. 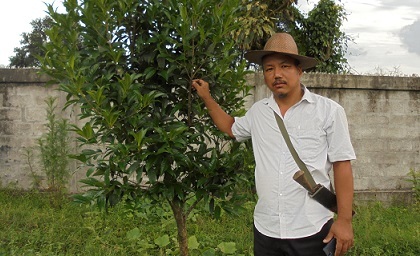 East Siang Deputy Commissioner Tamiyo Tatak, who launched the plantation drive by panting Chionanthus sapling at Raneghat bridge point, suggested the organizers to continue their mission and make Pasighat Smart City clean and evergreen. DC Tatak was accompanied by retired Director of Secondary Education of Arunachal Bodong Yirang, BRO’s Commanding Officer (Project Brahmank) Col MK Khare, Executive Engineer of Pasighat Municipal Corporation Kipa Gagung and local gaon burhas, who planted 20 saplings on the launching day. The NGO members, as part of their environmental activity, are taking up a project of plantation of Chionanthus tree in large-scale, which they believe to be an effective mechanism for reducing global warming. The NGO’s chairman Jobang Modi has a dream to make the hill State evergreen by plantation of Chionanthus tree at roadsides, educational institution, government office premises and human habitations. Modi has selected three varieties of Chionanthus (Chionanthus ramiflorus) grow in natural vegetation of Arunachal for plantation. He also developed a mini nursery for growing Chionanthus sapling at Ayeng village, his native village in East Siang district. Modi said that he made an official communication with scientists (botanists) of State Forest Research Institute (SFRI) in Itanagar, who have conducted primary study on efficacy of the evergreen Chionanthus, locally known as Kitir-Mimir (in Adi) belongs to Oieacea family. The tree provides comfortable shelter to many birds and insects and its fruit is favourite food for them. Besides rich ecological role, the species is easily survives on sandy, rocky and muddy soil, while it has much land grabbing capacity. It has vital role in maintaining terrestrial ecosystem and the plant species reportedly releases sufficient oxygen to air through photosynthesis. Modi informed that his natural conservation activities are backed by another Pasighat-based environmental NGO namely ‘Bonny Green Revolution’ led by Omeng Apum Modi.